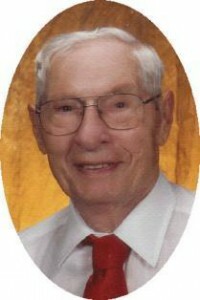 Jerome “Jerry” Eischen, 91, of Pierre Lane, Port Washington died Sunday, August 23, 2009 at his home. He was born on October 25, 1917. He was the son of Jacob and Margaret Becker Eischen of Dacada. He grew up on the family farm in Random Lake. He was a very creative person. By the age of sixteen, he built his own combination sanding and saw machine. He used it to help remodel houses for family. He also built two houses for his own family-one in Random Lake and one in Port Washington. He married Sylvia Watry of Port Washington on May 5, 1945 at St. Mary’s Catholic Church, Port Washington. He was employed at Jung’s Brewery, Damkot Tile Company, Gehl Mfg. Company and lastly worked at the Seitz Mfg. Co., for the last 40 years as a hone operator, retiring at the age of 80 in 1997. He was a kind and gentle husband, father and grandfather who enjoyed spending weekends with his family at their cottage in Antigo. He enjoyed dancing and playing cards with friends along with woodworking he made windmills, bird houses to share with others. Our beloved “Dad” will be missed deeply; now that he is heaven bound. He is survived by his wife of 64 years Sylvia; two sons Terry (Mary) Eischen of Chattanooga, TN and Tim (Patty) Eischen of Wichita, KS; two daughters Bernie Ansay of Port Washington and Bonnie (Ken) Jacky of Cleveland, WI; further survived by thirteen grandchildren-Carrie, Tina, Joey, Brian, Tanner, Christopher, Kaylyn, Nichole, Jared, Patrick, Kevin, Brenda and Kelly, along with nine great-grandchildren plus two in the near future; his brother Ray Eischen of Random Lake, other relatives and friends. He is preceded in death by his parents, two brothers Art and George Eischen and two sisters Julia Jacky and Adeline Zitzelberger. His mass of Christian Burial will be celebrated at Noon Saturday, August 29, 2009 at St. Mary’s Catholic Church, Port Washington. Reverend Tom Lijewski will be the celebrant. Interment will take place in the parish cemetery. Visitation will be held on Friday, August 28 from 4-7PM at the POOLE FUNERAL HOME, 203 N. Wisconsin St., Port Washington with a 4PM Rosary, as well as from 11:30AM Saturday AT CHURCH until Noon. Memorials to St. Mary’s Church, Port Washington appreciated.